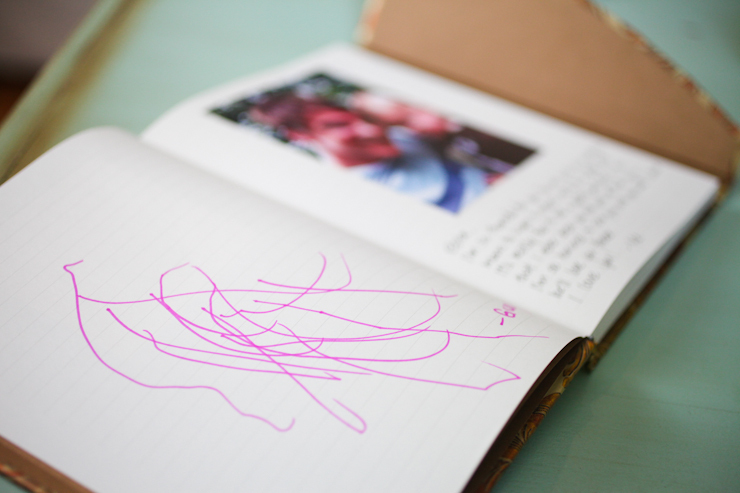 Liam (via Shawn) got me the sweetest Mother's Day journal. My mom sent me the idea... I sent it to Shawn... and Shawn ran with it. 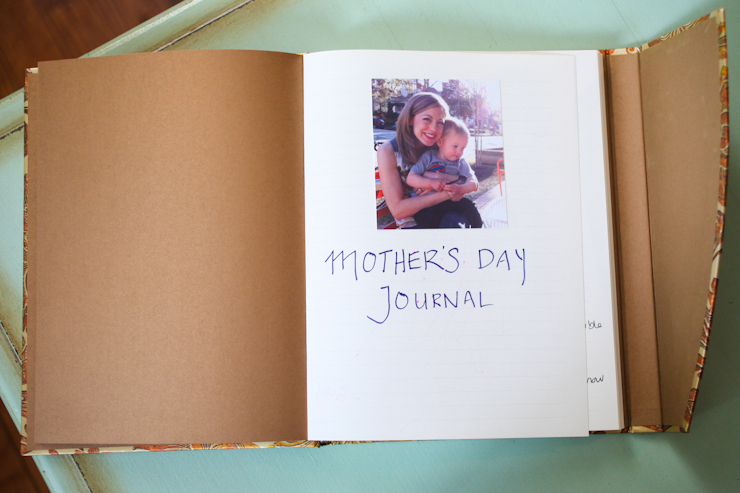 Instead of a Mother's Day card from Liam every year (which would inevitably get tossed or lost along the way), the idea is to write a little something in this journal each year so we can keep it all together in one place. I cried at the thought of all the empty pages that will be written in every year with snapshots of his beautiful life ahead. I can't wait. On Sunday morning as I was getting Liam dressed for church, I noticed pink marker all over his left arm. I asked Shawn, "Did you see him playing with a highlighter?" and braced myself to find it on our bedding or scribbled on a wall. Little did I know it was Sharpie that will be there for a while, but for a very worthy cause. I adore this sweet gift. My head is down. My head is down for much of the day. I am missing all of the miracles and beauty of the life right in front of me and around me and under me and above me and within me because my eyes are on a six inch screen that has nothing to do with me.I’m afraid that one day when my children think of their mama- the picture in their mind’s eye will be me with my head down- saying “one second, honey.” I’m afraid that when I try to help my kids navigate the world of social media for themselves- when I try to convince them that the internet is not the Real World- I won’t have a leg to stand on. Because they will do what I do and not what I say. Oh man. That hurt. While I feel like a fantastic mom in some areas, this isn't one of them. It's so easy to slide out my phone "for 10 seconds" while Liam eats lunch, goes to find a book, plays in our backyard. And I hate it. Sometimes, I excuse it by saying, "I have a blog and a handmade business, and it takes a social media presence to maintain it. And it takes staying up on online trends to make it successful." I see a lot of bloggers and handmade business owners who are also Moms and are also incredibly involved on social media. I've looked at them - more often than I'd like to admit - and thought, "How?!" How do they maintain such active social media accounts, run a small business, be a mom and wife - and do it all well? Maybe it's just me, but there just aren't that many hours in the day, even with the childcare that I have a couple times a week. I don't judge them a bit. But as Glennon attests in her article, "Being 'good' at the internet is much, MUCH too expensive for me. I can't afford it. I can't afford to exchange any more of my life for it." I couldn't agree more. It's just too costly. It's costly to my heart, too. The way it makes me jealous and unsatisfied in my own life when I see what other people post. Yuck. So for Mother's Day, I released myself from the pressure of maintaining all of that. I look down at my phone plenty with emails and Etsy messages coming in (both of which are necessary to make a living right now), so to make more space for looking up, I deleted my personal Facebook and Instagram accounts for now. Perhaps in another season, I'll pick them back up. And perhaps I'll post a few things on Brighter Day's account that I've neglected because I've wasted so much time getting caught up in what everyone else is doing. I know that real change isn't born out of guilt. But this time feels different. It isn't that I feel guilty about looking down at my phone, but it's that I truly don't want to miss what's happening when I look up. Just a few days away from Instagram and Facebook have assured me that, yes, this was the absolute best gift I could possibly give my son. Such a sweet idea!! Thanks so much for sharing.